Migrations occur all over the world, both above the water and below. To experience one of these sub-aquatic pilgrimages you simply have to be in the right place at the right time. Thankfully, scientists and divers have been studying various migrations for decades, and have pinpointed some of the best places to view these marvels of nature. Though viewing small pods of Humpback whales is possible almost anywhere in the world, being present as hundreds of these tremendous animals reunite is an experience unlike any other. There are only a select number of hotspots in the entire world where you can witness this dreamlike event. 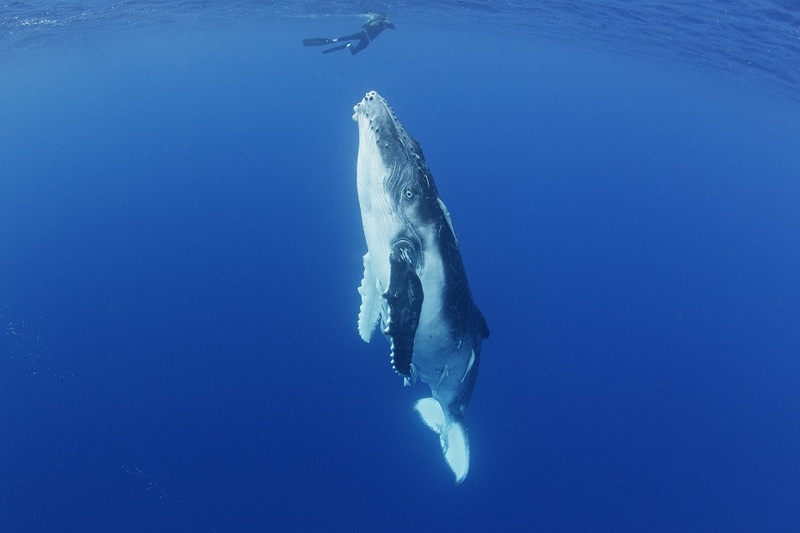 One of the most beautiful places where you can encounter and swim with humpback whales is on the Polynesian archipelago of Tonga. From August to September the humpbacks come from the frigid Antarctic to calve, seeking a warm asylum for their newborns. This is one of your best opportunities to see a baby and mother together, or even a live birth. Perhaps one of the most bizarre migrations occurs outside of Melbourne, Australia, where hundreds of Spider crabs congregate in a mass migration. Marching across the flat, sandy sea floor in droves, the mystifying parade of crabs all congregate in a single location, piling themselves upon one another until they form a pyramid. The pile writhes and shudders as more crabs clamber on, approaching from all directions as far as the eye can see. The migration begins as the waters cool, sometime between April and June. The entire affair only lasts about a week, so flexibility is key to a successful sighting. Diving is best off of Rye Pier, where you have your best chance to check out this alien pyramid in action. 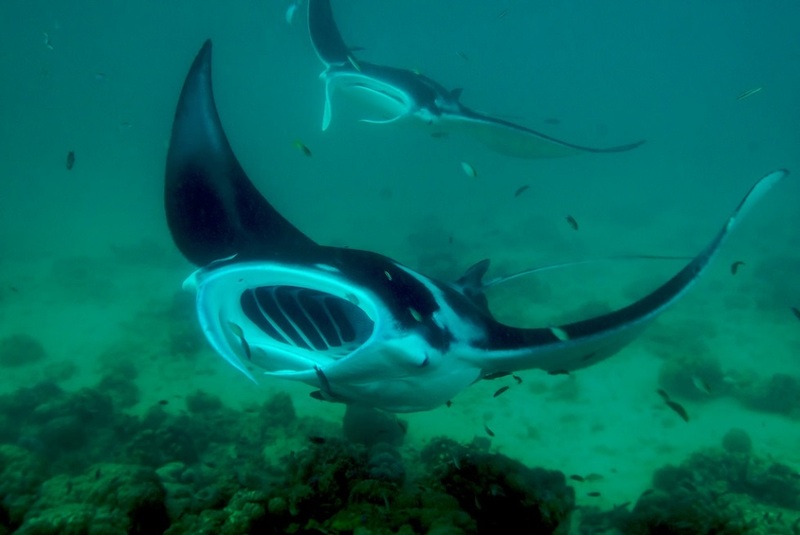 Graceful manta rays idle easily through the seas, their oddly shaped mouth funneling plankton as they glide. Manta Rays can easily reach 20 ft (6 m) wide and weigh up to 3,000 lbs (1,400 kg). Seeing just one of these striking creatures marauding the sea is impressive enough, but to view them in larger groups is awe inspiring. Manta rays reside in warm, tropical waters, and will travel long distances to reach their next meal. Though biologists are just beginning to understand their migration patterns, much is still unknown about these majestic animals. Visit the Maldives, Hawaii, and Fiji to get an up close look at the manta rays as they make their elegant backflips, slicing through the seas. Solitary and shy, a hammerhead shark is usually an elusive fish to spot. However, certain times throughout the year these unusual sharks congregate to breed. Though the hammerhead’s range is large, the best spots to scuba dive with massive schools of hammerhead sharks are in a very specific region, often referred to as “the hammerhead triangle.” Malpelo, the Cocos Islands, and the Galapagos Islands are without a doubt the height of hammerhead diving. Visit the Cocos Islands from June through September, Galapagos from June to November, and Malpelo any time of year. The largest (and quite possibly most exciting) migration in the world involves silvery fish, no longer than your finger. Sardines flock to the South African shoreline in their millions, indulging in a breeding and feeding frenzy along the entire coast. Occurring from May to July, these massive schools of fish are so large that they can be seen from space. The sheer number of fish, their movements synchronized as if telepathically, is not the only draw to this mesmerizing event. 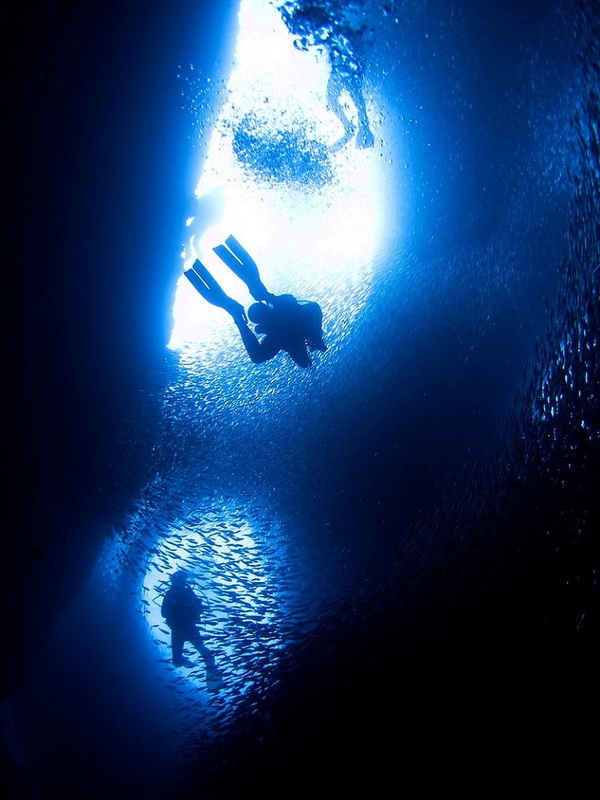 The creatures that come to feed on the shimmering sardines are what is truly memorable. Hundreds of dolphins, sharks, sea birds, and even whales come to prey on these small fish. Animals of a wild array of different species work together to corral the sardines into “bait balls” which they painstakingly devour, often down to the very last fish. South Africa is the only place in the world where you can witness this astounding migration, where cool currents filter up the Agulhas Bank past Mozambique, where warmer water awaits in the Indian Ocean. Will you join in the migration? There are locations across the globe where you can scuba dive during a migration, floating side by side with hundreds if not thousands of aquatic animals. Becoming a part, if only fleeting, of a mass reunification of mission driven creatures is a unique and humbling experience, and should not be missed by those with the passion to dive.